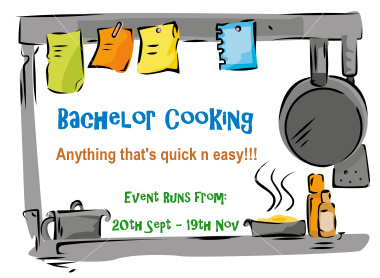 You must add a link to announcement page - 'Bachelor Cooking' event by SJ in your recipe. Usage of logo is mandatory as it helps spread a word. Only recipes with ingredients listed above is valid. Also, it should be quick and easy for students/bachelors to cook. Dishes can range from appetizers, soups, salads, mains, sides… Everything except desserts! If you’ve got some sweet entries, link up with Sweet Celebration with a giveaway. One must like my facebook page and subscribe me via email for valid entries. Any number of fresh entries are welcome. Max 3 archived entries are allowed. Non-Bloggers may send their entries on myownfoodcourt@gmail.com with contestant name, recipe name, cooking time, ingredients, method and picture of the dish. Drop a comment to this post once you link your recipes which will help me verify them. nice event n interesting..waiting for d recipes..all d best dear..